My botanical name is Agave americana but I am also known as American Aloe, Century Plant or Blue Steel Agave. I have bluish green radial-growing leaves with sharp teeth. I am native to Mexico but I was grown in Florida and am so happy to be going to my new home. I am a slow grower indoors but can grow 2-3 feet. Here are some care instructions and tips that will be useful as I get acclimated to my new home and grow with you for many years to come. My personality is elegant, minimal and peaceful. I have sharp thorns so make sure I am away from the reach of children or pets. You can also place me on terraces, balconies as I am resistant to the wind. You can place me in living rooms, hallways, bedrooms, offices, conference rooms, or anywhere with plenty of light. I will be happiest indoors where I can get bright, direct light daily. I can also thrive outdoors in full sun. 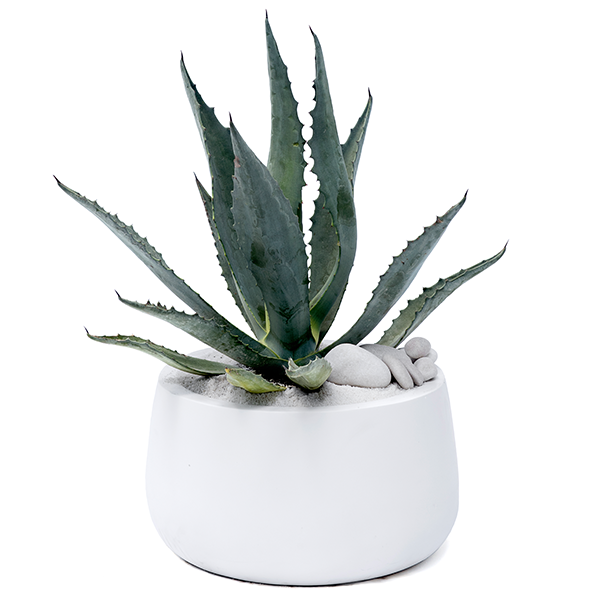 Aloes, as desert plants, need very little watering as they retain moisture in their core. Depending on where you end up placing me, I may get more or less thirsty and would require watering with more or less frequency. If you are doubting to water, it is better to underwater then overwater. The humidity in the room, the time of the year, and the amount of AC/Heating, among other factors will all affect my watering needs. Fortunately, it’s easy to figure out what to do as I will show you how I feel; you just need to check up on me once in a while. Start by watering me once per month. Use a spray bottle, watering can, or measuring cup to water me with approximately 6 ounces (177 ml) of watering per session. Check up on the same day of the month by inserting your finger into the soil about half an inch and feel the moisture level. If it feels moist, try again in a couple of days. If the soil feels dry, you need to water me as instructed above. Once we do this for a few months, you will get the hang of it and you can determine the best watering schedule for your light, temperature and moisture conditions. You can use cacti and succulent fertilizer once a year. Too much plant food causes excess salt build up in the soil that can result in damage to the plant. Agaves should be kept in the warmest room of the home in a bright sunny location. Root rot may be caused by low temperatures, low lighting, and excessive watering. Always use gloves when handling your agave, as my spines can be painful.